Caveat: I’m sure I’ve missed some points. But you should get the gist of the conversation. A - Showed him the Strava print out. 82 registered Strava users have ridden that segment 2,829 times since circa 2011. B – Gave story of the original See & Be Seen Dunwoody Cycling route that was on this segment. After a couple of weeks, riders had it changed, because it’s not bike friendly (no shoulders, narrow lanes, busy, etc.). Said organized group rides all try to minimize our time on any busy roads, so we’re not that readily visible. C – Said we make up our own Recreational routes to avoid traffic and for exercise. A completely different purpose from getting from point A to B in a utilitarian fashion to go shopping, as a commuter, etc. D – Told him that GDOT put bike lanes last year on Ponce de Leon in Atlanta, with around 33,000 cars per day. – Jay asked if there were bicycles on it, I said yes. I should have shown him a video of that, too. This video was taken during evening rush hour on Monday, August 4th -- just a few days ago. E – Played him my video of me riding on Chamblee-Dunwoody & how “uncomfortable” / “dangerous” it is. Said of course people like my wife would never choose to ride on this road in its current condition. F – Played him the Roswell Police Department’s You Tube Public Education Video on “Sharing the Road – Georgia’s 3-feet Passing Law”. The video clearly shows cars crossing the yellow center line & Roswell PD in the comments section clearly states it’s permissible to do such. I gave examples of a Post truck. Delivery Truck, UPS. Or in rural areas, farm tractors. G – Described to him how nice Mt. 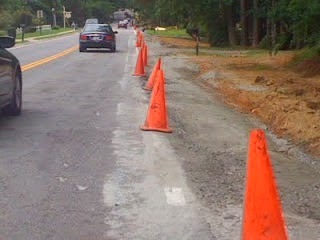 Vernon is west of Ashford-Dunwoody with the new Bike Lanes. Before, cars were having to wait for cyclists. And we cyclists had to “squeeze” in to ride, often getting “buzzed”. Now we both have our own place, which keeps traffic moving smoothly and it’s safer. I - Jay brought up Columns Drive and when he’s driving his car, he’s so “fearful” of hitting bicyclists that at times he won’t even try to pass. I replied that I do not like to ride on Columns. I said that because there’s NO SIDEWALKS, it FORCES pedestrians & runners out onto the street. ISSUE #2 – Jay (paraphrasing) indicated that his perception is that bicycling is mostly for optional recreation / asked if there actually were people out there going from A to B, etc. and how it’ll be a connected network. Once it’s connected, there will be more & more people using them. B – 40% of all trips in the US are 4 miles or less. That’s too easy to ride a bike. Discussed Jett Ferry / Williamsburg to Dunwoody Village is two miles. & Dunwoody Village to Georgetown is also only 2 miles. Not only will this open it up for weekend casual recreational riders wanting to get some basic exercise, it will allow people to ride their bikes to Starbucks, meet friends for lunch, short errands, etc. 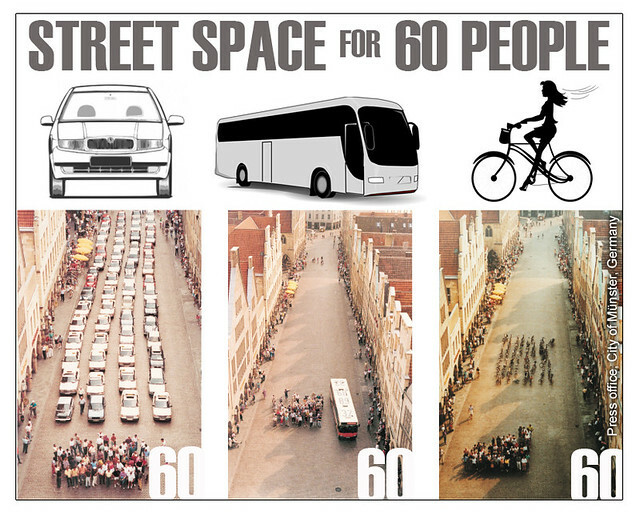 C – Showed him the infographic of the space for 60 people in cars _vs_ bikes. As an example, I discussed the vast numbers of parents driving their kids to school. Said if we could have SAFE Routes to School (mentioned Decatur), then a few percentage of those parents just might let their kids walk or ride their bike to school, REDUCING motor vehicle congestion in the morning. D – Roberts Drive Bike Lanes (2011)-- Said once the bike lanes were installed, Austin Elementary had to get a THIRD bike rack, with all of the kids riding their bikes to school. Told the city WIDENED a couple hundred feet on Roberts (for about $50k) on a particular segment to get the extra width to have the Bike Lanes. Said it was 100% within the Public Right of Way. Said that this year (2014) just now the Council has approved installing sidewalks on the west side of Roberts along the same segment, making it a “Complete Street”. E – Spoke about legitimate commuters going to MARTA, etc. 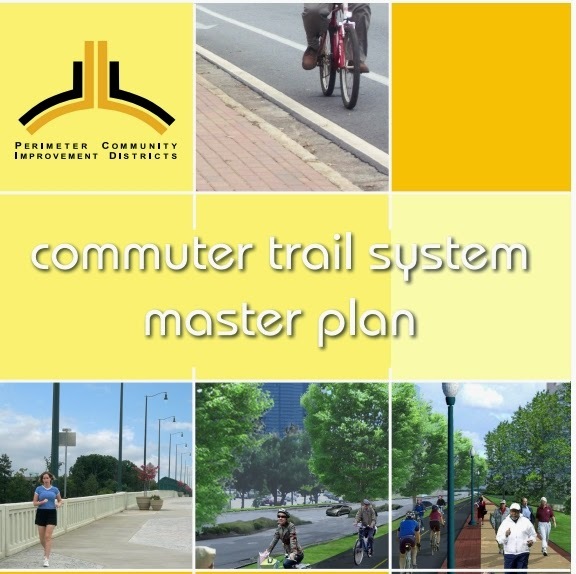 They are building out a network within the business district of trails to connect the office buildings to the two MARTA stations, shops, restaurants and offices. ISSUE #4 – City will NOT install the sidewalks as part of the current “Complete Streets” project on Chamblee- Dunwoody if it’s over budget. The city will (paraphrasing) ‘First & foremost” widen the road by the required 8 feet (true) and install Bike Lanes. Then, if there’s enough budgeted money left over the city would install the sidewalks. I just thanked Jay for his time. It was cordial, casual and very open. I didn’t ask him to change his mind. I just asked him to take a look at the information I was providing and to consider it. 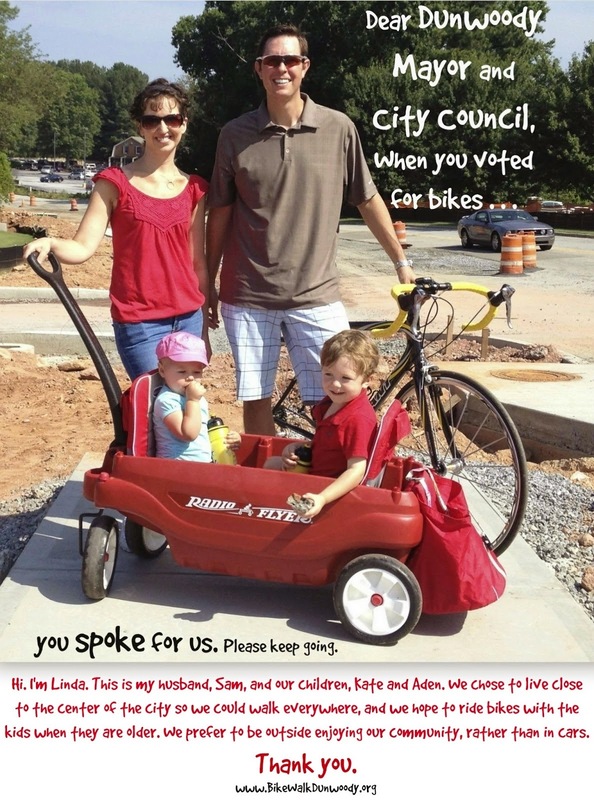 6-page color print out of 12 of the other Bike Walk Dunwoody PSA photos (2 photos per page). · “81% of respondents either strongly agreed (37.0%) or agreed (43.9%) that they would ride a bicycle more frequently if their community had better bicycle facilities such as bike lanes or multi-use paths. 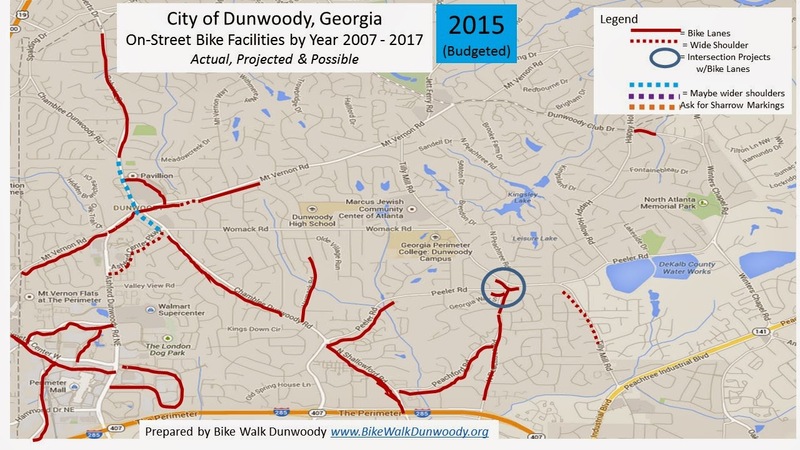 Copy of City of Dunwoody Resolution on” City of Dunwoody - Action Plan for Bicycle Friendly Community - Resolution 2009-11-63” Passed unanimously & signed my Mayor Ken Wright in November, 2009. 1-page extract from page 2 of the May 2014 Budget Report showing the Pie Chart of City Expenditures. Used this just to put things in perspective of where we are spending our money. 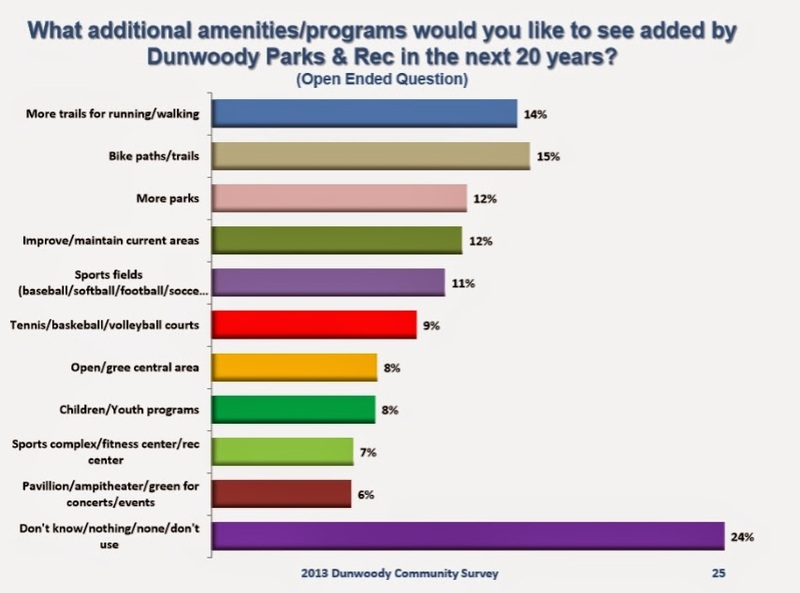 Jay said it’s a shame we don’t have active Parks & Recreation system such as in Roswell. These short trips offer a terrific opportunity to take to the streets by foot or by bike instead of by car. Develop and adopt a protocol for roadway re-striping to better accommodate bicyclists on roadway segments where excess pavement width is available. Work / Offices, Retail, Schools, Government, etc.